Metal patio chairs and tables make attractive and durable outdoor furniture. Educating yourself about the different types of outdoor metal furniture available will help you choose the type that's best for you. Most metal outdoor furniture is made from wrought iron, aluminum or steel. All three are good choices for outdoor furniture. Aluminum: Aluminum patio furniture is the most lightweight metal furniture. Aluminum is easy to clean, is resistant to corrosion and is a very portable. Steel: Steel patio furniture is medium weight and more flexible than wrought iron. To avoid rust, make sure you purchase stainless steel or galvanized steel furniture. Steel furniture is very durable and can last for many years. Wrought Iron: Wrought iron or cast iron outdoor furniture is the heaviest of all metal furniture. This type of furniture will hold up well under harsh weather conditions and can't be blown away by strong winds. The type of metal you choose for your outdoor tables and chairs will be a matter of personal preference, local climate and the style that appeals to you most. The metal on outdoor furniture is specially treated to resist rust. Galvanized steel has a special zinc coating to protect it from rust. Stainless steel is allied with chromium and nickel, which provides a rust-proof finish. Some metal outdoor furniture has a powder-coated finish. An electrostatically charged coating is sprayed onto the metal, which is then heat cured in an oven. The coating is made up of ground pigment and resin, which adheres to the metal better than liquid paint. The result is a very strong, long-lasting finish that is scratch-resistant and rust-proof. 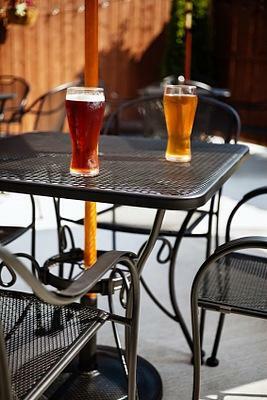 Proper care and maintenance of your outdoor metal tables and chairs will protect the investment you made in purchasing them. The type of metal furniture you buy will determine how you should care for it. Keep in mind that the springs and moving parts on all types of metal chairs should be oiled once a year. Although aluminum will not rust, a lot of aluminum outdoor furniture is treated with a powder-coated finish. Elements such as car exhaust, suntan oils, sweat and salt water can deteriorate the powder coated finish on aluminum furniture. You can protect the finish by frequently washing with a mild dish detergent and warm water. Be sure to rinse the furniture well. Wrought iron outdoor dining sets will require the most care and maintenance of any other type of metal furniture. You will need to clean it regularly with warm soapy water, taking care to rinse thoroughly and also dry it. You can apply wax to smooth surfaces and mineral oil to textured surfaces. Use steel wool to remove any rust or scratches and then apply several coats of metal paint. Be sure to let each coat dry thoroughly before applying the next. Steel tables and chairs can also be cleaned with a mild detergent and warm water. As always, rinse well. You can apply a coating of paste wax for extra protection. Although most metal outdoor furniture is a very durable, there are things to look for to make sure you are getting the best quality furniture you can buy. When buying wrought iron tables and chairs, look for sets that are made out of solid metal instead of hollow tubing. Try to find chairs and tables that are welded together instead of bolted together, as welded chairs and tables are much more durable than furniture that is bolted. If you live in an area where high winds are common, this would be the best type of outdoor furniture for you. There are two types of aluminum furniture. The first type is made from hollow core extrusion tubing. This type of furniture is very lightweight. However, it may be too light. This type of furniture does not hold up well to strong winds and is not as strong as cast aluminum. Cast aluminum pieces are almost always solid. This type of furniture is better for outdoor dining sets. Hollow tube aluminum furniture works best as poolside furniture. Vinyl webbing or straps on your metal chairs should have built-in mildew inhibitors and ultraviolet stabilizers. If your metal tables and chairs have any wood pieces, make sure the wood has been treated with a waterproof finish. Metal outdoor furniture is very attractive and now with lightweight materials such as cast aluminum, your outdoor tables and chairs are portable as well as durable. Best of all, metal patio chairs and tables can stay looking beautiful for decades as long as you buy quality items and properly care for them.